SANTA CLARITA, California (WTVD) -- While many of us were trying to figure out where to discard our Christmas trees, one California woman decided to return hers. On Jan 4., the woman reportedly took her tree to a Santa Clarita Costco asking for a refund because her tree died. One shopper, who was waiting in line behind the woman, was so blown away that he posted about the exchange on his Facebook page. "I can't make this stuff up," Scott Bentley wrote. 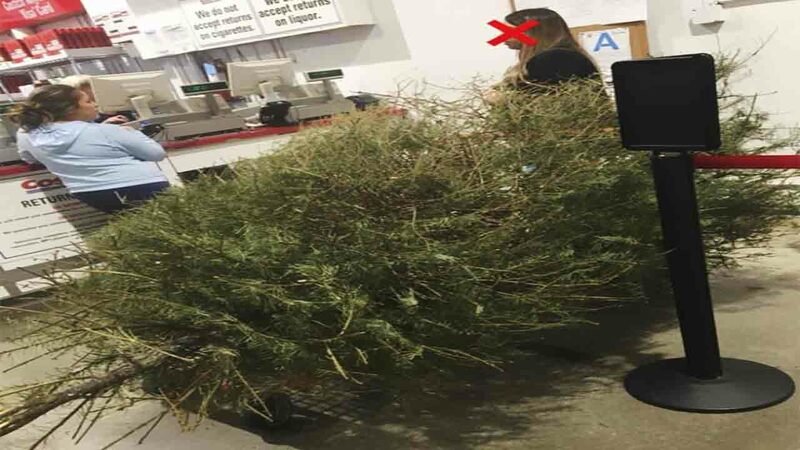 "Woman in line at Costco, totally nonchalant, to return her Christmas tree 'because it is dead' on January 4." The man even shamed Costco for allowing the "ridiculous" return to occur and the woman for asking for her money back. "Heartbreaking to think she may have needed that money so much, she lost all self respect and dignity for it." Surprisingly, Costco did issue the woman a refund, Bentely said in his post. But it did cost her. "It was questioned, verified purchase on her account and she was shammed (shamed) to a small degree ... but I don't think it fazed her because she has no conscience." The woman still hasn't been identified; however, she did give shoppers on social media a new idea for next year.